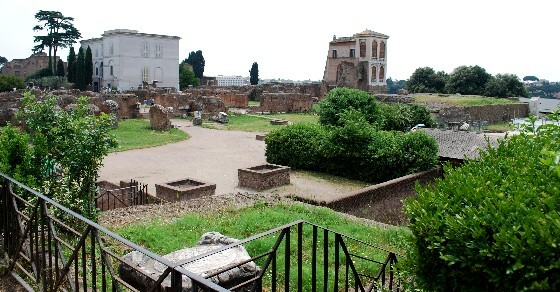 Across from the Colosseum you’ll find the rest of the ruins of Ancient Rome. You’ll find the ruins of temples, basilicas, palaces, houses, gardens and even a brothel! We liked the view from the greener Palatine Hill down onto the main Forum. 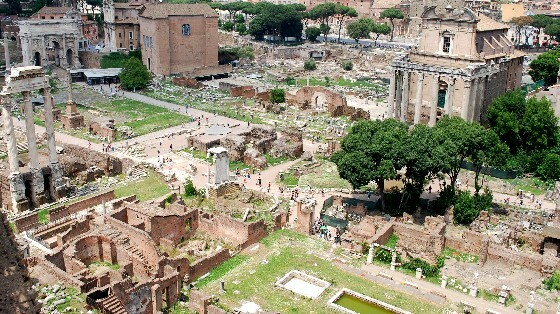 The Forum used to be free, but there is now an admission fee which covers both Palatine and the Forum ruins. Check your ticket if you’ve been to the Colosseum as admission is usually included to the Forum and Palatine area too. Many people don’t realise and then buy an extra ticket they don’t need. We found the Forum area fascinating, but also frustrating as little is labelled. You probably need the audio tour to get the most out of it (at extra cost). Nearest metro stop is Collosseo. This is an extract from our free Rome City Guide. When walking around the forum area, the sheer size of the cobbled road surface is one of the first things you notice. Imagine trying to get a horse a cart along that! None of the buildings have survived intact as stone and marble was removed from the forum to create other buildings in Rome. Even so, some buildings have had columns and footings rebuilt to give you an idea of how it might have looked. There are some labels and signs, but nowhere near enough. We also were not given any kind of leaflet to explain what we were looking at. As such, the ruins are impressive but we really don’t feel we got that much out of our visit. We think the audio guide should be included in the admission price and that many more signs should be erected to help visitors to understand what they’re seeing. The Roman Forum and Palatine are open daily from 8.30am to 7.15pm (Apr-Aug), 8.30am to 7pm (Sep); 8.30am to 6.30pm (Oct), 8.30am to 4.30pm (Nov-Mar). Last entry is one hour before closing time. Admission covering Foro Romano, Palatine & the Colloseum is 12 Euros per person. The audio guide for Palatine and Foro Romano is another 6 Euros per person whilst guided tours of Foro Romano cost 4 Euros (2012 prices). Alternatively, consider a guided “skip the line” tour to get the most out of your visit to Palatine Hill. The Ancient Rome and Colosseum Walking Tour is very popular and consistently gets 5 star reviews from those who’ve been on it. The Roman Forum is across the road from the Colosseum and is a short walk from the huge white monument which marks the first king of a united Italy (Monumento A Vittorio Emanuele II). This landmark can be seen around most of central Rome.